ASAP’s CSA Fair is this week! Join us on Thursday, March 14 (Pi Day! ), from 3-6 pm at New Belgium Brewing Company (21 Craven Street, Asheville). 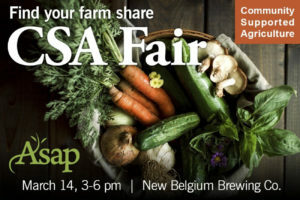 The CSA Fair is an opportunity for you to meet farmers in person and learn about their CSA programs and products. It’s a friendly setting to learn more about your options, or bring your checkbook to subscribe right on the spot! All participating farms will have pickup locations in Buncombe County. Visit our website for more information and a list of participating farms.